KARACHI: Sindh Chief Minister Syed Murad Ali Shah on Monday appeared before the National Accountability Bureau (NAB) and recorded his statement in the fake accounts case. Sources said that anti-graft officials grilled Shah for about an hour and a half. He was also handed a questionnaire regarding the Thatta Sugar Mills to which he has to respond to within two weeks. The Sindh CM had been instructed to bring along all records pertaining to the Sakrand, Khoski, Pangrio and Thatta Sugar Mills, as the investigation continues into the mega money laundering and fake accounts case. The Supreme Court had formed an investigation team to probe the fake accounts case. The team submitted a report in which it named 172 people, including former president Asif Ali Zardari, his sister MNA Faryal Talpur, son Bilawal Bhutto-Zardari and Murad Ali Shah. 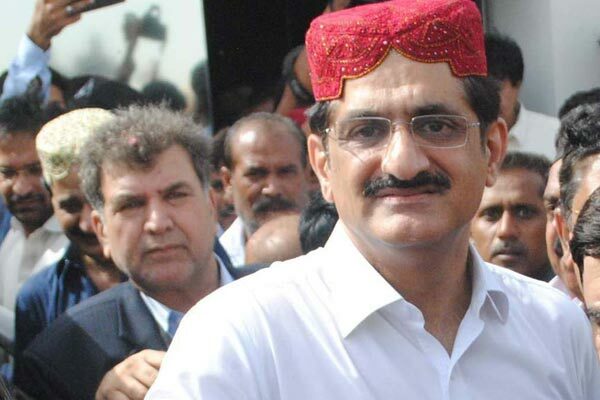 The Sindh CM was scheduled to appear before NAB on March 26, however he requested to appear before the bureau on March 25. Pakistan People’s Party (PPP) senior leaders Syed Nayyer Hussain Bukhari, Qamar Zaman Kaira, Mustafa Nawaz Khokhar and others were present outside the NAB building during Shah’s investigation on Monday. Talking to media after his investigation, Shah said that the NAB officials questioned him about Thatta Sugar Mills and that he responded to all the queries. Shah further said that he had assured NAB’s officials of his cooperation in the investigation. “I answered all their questions and assured NAB of my full cooperation. I expressed reservations that the JIT report’s conclusion was wrong and the counsel of the investigative team admitted that,” he said. “The chief justice has also stated that PPP Chairman Bilawal Bhutto-Zardari is innocent,” he added. “My media trial is being conducted,” the Sindh CM further said. “I came here today on my personal expense and hundreds of guards were deployed here, however, had I been asked to appear in Karachi I would have appeared quietly. The case is being heard in Rawalpindi but all the people are in Karachi and none of our experiences in Rawalpindi has been good,” he added. Speaking to the media alongside Shah, PPP leader Mustafa Khokhar criticised the Pakistan Tehreek-e-Insaf (PTI) government of what he said was the locking down of the federal capital on Monday. He said that the party didn’t give any call to workers to show up at the NAB office and the government wasted public money on security arrangements. Meanwhile, PPP leader and former Sindh chief minister Qaim Ali Shah on Monday filed a petition seeking pre-arrest bail in the fake accounts case. A division bench of the Islamabad High Court (IHC) will take up his petition on Tuesday. Shah, who is scheduled to appear before NAB on Wednesday, expressed apprehensions that NAB officials may arrest him upon his appearance before the investigation team, and requested the IHC to grant him pre arrest bail. The former chief minister was named in a report by the joint investigation team tasked to probe the case. He was among 172 people named in the report whose names were to be placed on the no-fly list. The senior politician in his petition contended that he was being politically victimised through the case, and claimed that he had been dragged into the case without any solid evidence. Shah said that he had been politically active since 1960 when he was elected chairman of the Khairpur district council and then successfully contested the general elections. He said that he was the longest serving chief minister of Sindh and had completed eight consecutive years in office. The former chief minister sought bail on the grounds that he is a senior citizen. The petition stated that Shah is 85-years-old and is entitled to pre-arrest bail due to his age. The PPP leader, in his petition, cited chairman and director NAB and director general of the Federal Investigation Authority as respondents.